Fainting is the most common in-flight medical emergency on European airlines followed by stomach upsets, a German study suggests. 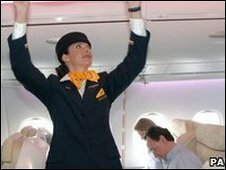 The study, in the journal Critical Care, found 5,300 cases of fainting on two airlines between 2002 and 2007. An aircraft had to be diverted to land at a nearby airport 279 times for medical emergencies. The researchers say emergencies are rare, but can can have a significant effect on passengers and cabin crew. The study looked at 10,189 different emergencies in around 5 million flights. It found there had been 926 cases of gastrointestinal disorders and 509 heart emergencies. The most common surgical emergencies were blood clots and appendicitis. The most frequent medical reasons for diverting a flight were: heart attack (22.7%), stroke (11.3%) and epileptic seizures (9.4%). Michael Sand, who led the team of researchers from the University of Bochum, Germany, said: "Although in-flight emergencies are rare in general, they can have a significant effect on other passengers and crew, potentially with operational implications for the flight." The average passenger age is rising and by the year 2030 it is estimated that half of all aircraft passengers will be over 50 years of age. The researchers say changes in the cabin temperature, humidity and air pressure plus increased security and delays can all trigger medical emergencies. But of the 32 European airlines who were approached, 27 did not have the data available, one had data that was unsuitable and two refused to take part because of company policy. Mr Sand said standardization of medical emergency reporting was important so that the contents of the onboard medical kits could be sorted out. He noted that not all of the airlines had heart defibrillators. "Considering the fact that cardiac conditions were the third most common condition seen in this study, patients with cardiac irregularities may profit from on-board automatic external defibrillator." Mark Wiltsher for the Civil Aviation Authority said: "All cabin crew must receive training in first aid each year. An operator can't operate a plane unless it is equipped with readily accessible first aid kits. "There is a list of equipment planes must carry but heart defibrillators are optional. And there is an annual audit of whether airlines are complying with the regulations."